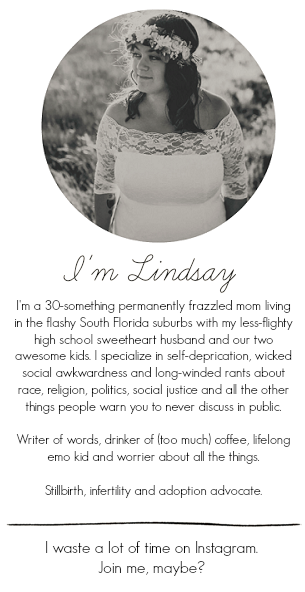 It's been an interesting week over here in teething-land. I've learned that we've been pretty spoiled when it comes to Ethan's teething. In the past, he's been a little fussy or more inclined to gnaw on you when he's cutting a tooth. I thought this was absolutely horrendous until this week began and I learned what it's like to have a toddler who is cutting molars. Oh, molars, you cruel and painful little things! This week has been something else. Poor Ethan has been in absolute agony with moods to reflect it and, strangely enough, his eating habits have gone a little awry. He wasn't into trying new things this week or things that were particularly crunchy or harder to chew. He sent his dinner back the other night (by way of the floor) until I produced pasta with cheese mixed into it. Cheese has been a big factor in this week's lunch menu, mainly because it's one of the few things he's tolerated eating. Everything had to be smothered in cheese or he refused to so much as open his mouth for it. I did my best to accommodate his desire for soft, cheesy foods this week, as you'll probably notice. For the most part, his lunches were still a success! 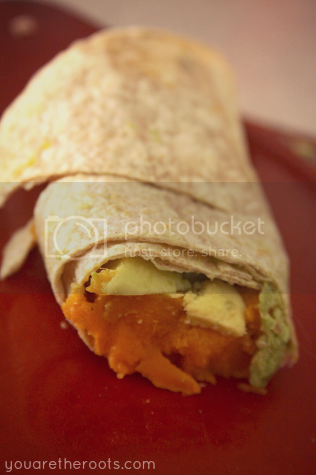 These Avocado & Sweet Potato Wraps didn't have cheese but Ethan let it slide. The soft, buttery avocado and baked sweet potato were mushy enough for him to eat without causing too much discomfort to his pesky teeth. I served him 1/2 of the wrap for lunch and cut it into smaller, bite-size pieces. He ate about half of the pieces this way and then unwrapped them to eat the avocado and sweet potato separately. I had steamed a small organic sweet potato and chopped it up into smaller chunks along with an organic Haas avocado. I had picked up some whole-wheat wraps at the deli counter at the grocery store which were quite large, so 1/2 was the perfect size. Tuesday's lunch was fully geared towards taking his mind off of his teeth. It's also smart that I made a lot because a great deal of this ended up on the floor. This was a simple Toddler Dipping Tray because dipping is apparently all the rage when you're a toddler. It was both a sensory activity and a meal as my overachiever tried to use a fork to do his dipping (hence a great deal of food ending up on the floor as cat snacks). Eventually he gave up and went to dipping using his fingers. 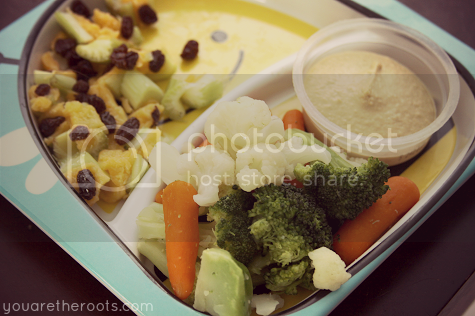 I steamed some carrots, broccoli and cauliflower and served them on a plate with some hummus. Sabra makes these cute little hummus containers which are perfect for such an occasion. I also melted some organic cheddar cheese into pieces of celery and sprinkled raisins across them. Ethan loves picking up the raisins and pressing them into the cheese. I discovered this one day last week while trying to prepare him "ants on a log." It turns out he very much likes arranging the "ants" himself. I was a bit nervous about introducing mushrooms on Wednesday as Ethan had never had them before. Luckily he absolutely loved them and these Black Bean Stuffed Mushrooms were a success! I had picked up some cute little organic button mushrooms at the grocery store. I hollowed out the cap which was simple to do just by twisting off the stems. I then brushed the hollowed caps with some olive oil and set them on a baking tray while the oven preheated to 400 degrees. In the meantime, I cooked and seasoned some black beans with some freshly minced garlic, cumin and black pepper. I stirred in a tablespoon of tomato sauce and simmered for about five more minutes. Once the beans were ready, I transferred them to a small bowl and added about 1 1/2 tablespoons of whole-wheat breadcrumbs to bind the mixture which I then scooped into the hollowed mushroom caps. I then baked them at 400 degrees for 20 minutes. Once they were finished, I topped them with some mozzarella and parmesan cheese and served them with some avocado slices. Ethan devoured these and I'd say they were the biggest hit of the week! Color me surprised. 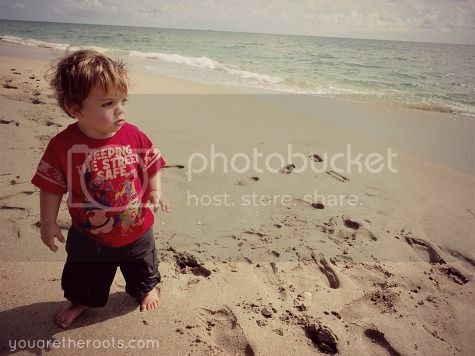 Thursday was a beach day. 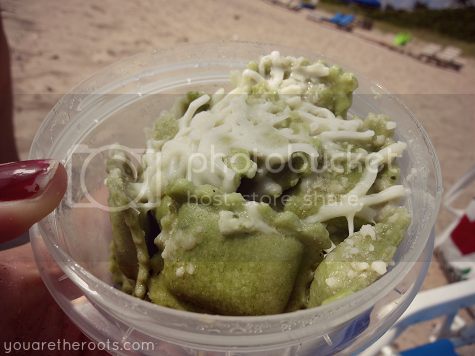 I brought along some Rising Moon Organics spinach and feta ravioli for Ethan. I still had to top them with mozzarella cheese to capture his attention despite ravioli usually being Ethan's go-to food of choice. It's okay, he ended up deciding later on that he's still a huge fan. 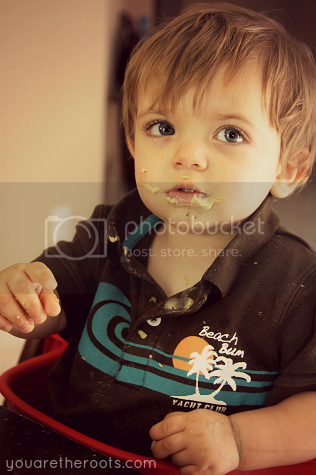 On Friday, Ethan didn't want to eat anything that wasn't a chilled fruit puree pouch but then we ran out of those. 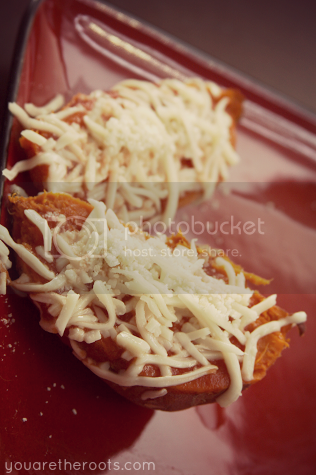 I baked a tiny, itty-bitty organic sweet potato, sliced it in two, spread some tomato sauce on the top and sprinkled it with cheese. Once the cheese melted, I cut it into tiny bite-size pieces and served the Sweet Potato Pizza to Ethan. He loved it and I narrowly escaped disaster. We had a birthday party! Anyway, these were simple to make. I preheated the oven to 425 degrees and lightly greased a baking sheet. I chopped an organic zucchini into thin slices and set aside. In the mean time, I poured 1/4c of organic olive oil into a small bowl. In another small bowl, I combined 1/2c Parmesan cheese and 1/2c fresh breadcrumbs (the ones I had on hand were gluten free ones I made the other day so that's what I used). 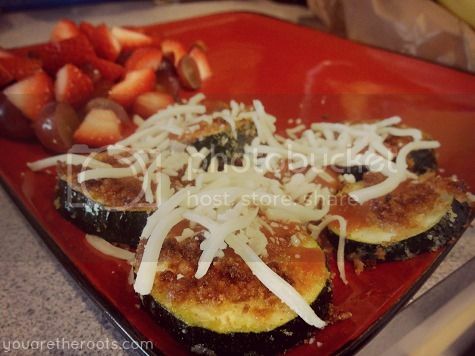 I dipped each zucchini slice into the olive oil and then into the Parmesan and breadcrumb mixture and then placed them onto the baking sheet without any overlapping. You bake the coated zucchini slices for 25 minutes. I topped Ethan's with some tomato sauce and some mozzarella cheese. He loved it! 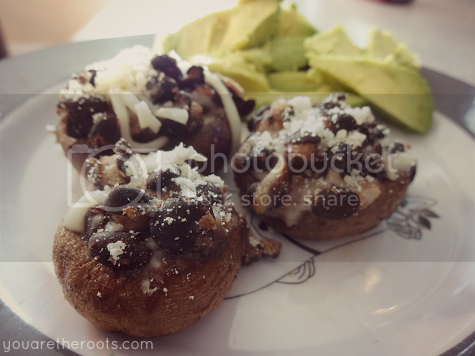 I'm going to have to give the Black Bean Stuffed Mushrooms a try!